(From Venus Optics / Laowa lens literature) Previously funded in Kickstarter and ranked 2nd in the all-time most funded lens project, this is the world's first consumer-grade probe lens which focuses from 2:1 macro to infinity and with a compelling wide angle "Bug Eye" perspective. The wide angle design means much more depth of field at close distance than conventional telephoto macro lens so that more background details can now be seen. The front barrel of the lens is designed to be waterproof and a LED ring light is mounted at the tip of the lens. It can cover both standard 35mm full frame & Super35 image sensor and it is super light to carry. Canon EF, Nikon F, Sony FE, Pentax K, Arri PL mounts are available. "Cine-mod" version, with standard gear focus and aperture rings, is specifically designed for videography purposes. Macro lenses in the market tend to have a long focal length (from 60mm to 120mm) and the subject fills most of the frame, isolating it from the surrounding environment. Our Laowa 24mm, instead, allows you to focus really close (2cm @ 2:1) to the subject, showing a great amount of detail and texture. But at the same time, you can enjoy a compelling wide angle 'Bug Eye' view (84.1°) so that more background details can then be included in the shots. You can easily create a very informative and stunning macro bug-eye perspective that no other lenses can do. The fact that it can focus really close to the subject enables a lot of shooting possibility. As macro photographers ourselves, we usually face the problem of not being able to shoot smaller subjects. With our Laowa probe, you can now take advantage of the 2:1 maximum magnification to shoot really small bugs and reveal details that cannot be seen by naked eye. It is particularly useful for videography as both finer details and environmental background can be captured in one shot. Do not understand this weird design? For traditional macro lenses, you need to get so close to your subject in order to take a good macro shot but some areas are just simply inaccessible. Thanks to the 40cm (15.7 in.) long barrel, you can focus really close to the subject but still keep yourself and your camera distance away. This feature is super useful and makes your macro shooting so much easier. Imagine how convenient it will be to shoot a frog hiding in the bushes using our Probe lens, compared to getting your typical 100mm macro lens super close to it to avoid leaves blocking your subject. You think this is cool enough? Think again. 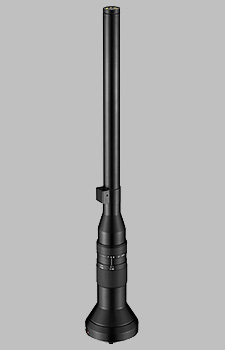 In order to bring you an even more exciting perspective and take your photos or video to the next level, we have made the front barrel of the Laowa probe waterproof. The waterproof design also implies shooting in dusty environment or with fine powders are not going to be a problem anymore. You can literally use it ANYWHERE. What, it's a f/14 not f/1.4? Why is there a LED ring light at the front? Macro photography are about Depth of Field and so smaller aperture is usually used. A LED ring light (powered through the micro-usb slot on the barrel) is embedded in the lens tip to provide additional lighting for focus assistance. In most cases, the more lighting you have on your subject, the better your shot will look. The Laowa 24mm f/14 Probe can cover both the standard 35mm full frame & Super35 image sensor. From indie to professional. From macro to wide angle. From still to video. From studio to wildlife. This lens is designed for everyone. This lens is designed to bring each and every photographer and videographer a new striking perspective to shoot. Are your ready to infuse your creativity into this lens and create shots that nobody has seen before? The Laowa 24mm f/14 2X Macro Probe doesn't have any user reviews yet!